SloClap’s Absolver is and isn’t one of the best games I’ve played this year. It’s unique take on hand to hand combat is by far the game’s bread and butter and I can’t recall a game where I’ve felt more like I was actually doing martial arts. Unfortunately, in between the intense moments of reading opponents moves and firing my own back I found myself wandering around a largely- lifeless, mildly-claustrophobic open world wondering what the game could have been if it had been a bit more fleshed out. There are no side quests, no real distractions at all to be found in the world of Adal. It’s empty. It’s maddening at times. But, it’s completely deliberate. 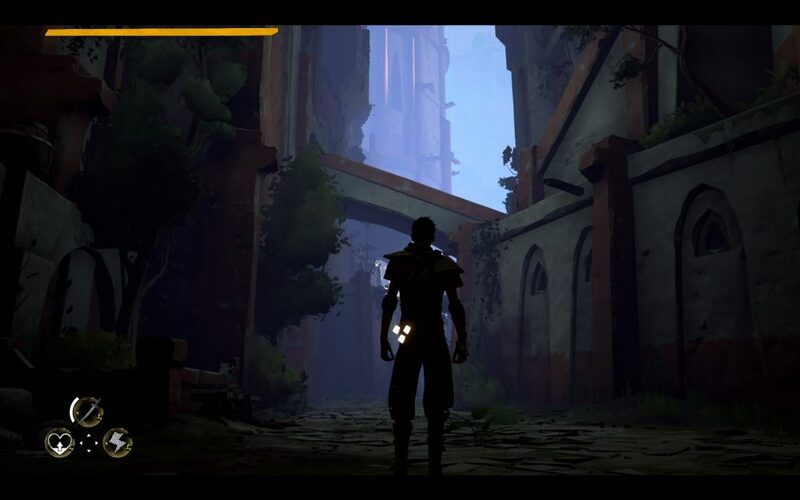 Absolver’s barely-there story is your character’s rise from a lowly Prospect to Absolver and is as ambiguous as the rest of the game. You’ll wander the world, fight all the dudes that need to be fought and rise to the position of Absolver. I wish the game’s namesake title held more weight. By the time I finished the game I felt like I had learned a lot but barely accomplished anything meaningful. For how short it is, the “Boss” encounters are all relatively challenging, especially if you’re going at them solo. I lost at least once to each of the bosses I went up against before finally figuring it out what I needed to do to best them. All told the campaign took me roughly 5-6 hours to complete. The meat of the game is really in the PvP and “Combat deck building” aspects. How the combat in Absolver comes together and feels is absolutely brilliant and full of choices. Right from the get go you’re asked to chose from one of three styles: Forsaken, Khalt, or Windfall. Once you choose a style you are unable to switch. Luckily there are multiple character slots so you can try out all of them and figure out which is best for you. Each style has it’s own unique defensive ability. Forsaken can Parry attacks, Khalt can straight up absorb attacks, and Windfall(my personal favorite) is all about dodging attacks at close range. All three of the starter styles are rated by “difficulty” but I found the rating of the three styles to be pretty arbitrary. I had more trouble timing the Parry and Absorbs with Khalt and Forsaken but was perfectly adept at timing my dodges with Windfall. A final fourth class, Stagger, is unlockable in game after encountering a particular enemy. 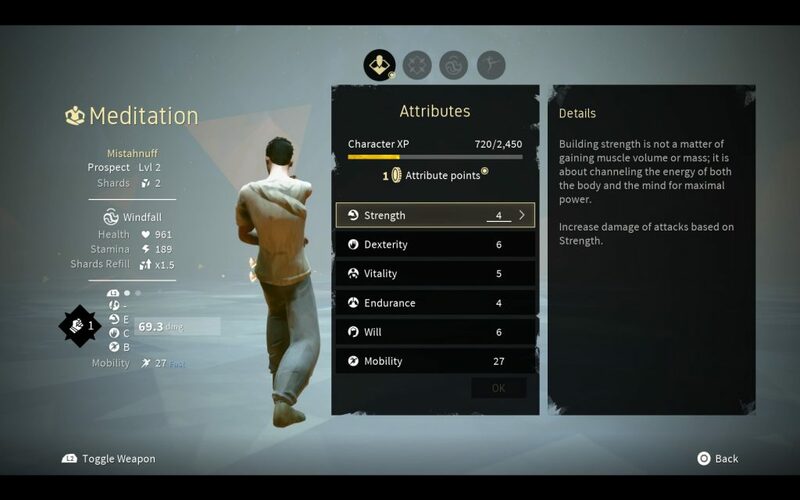 This Drunken Master type style mixes Offense and Defense Simultaneously and is meant to be the most difficult style to master in Absolver. Each of these styles also ties into one of the attributes you can increase by leveling up. Paying attention to which style is effected by which attribute is key to success in PvP. While they don’t explicitly tell you what style is anchored to which attribute it is pretty clear before committing any points what effect it will have on your current build. You also gain a few special moves via leveling up: Being able to quickly drain an opponent of stamina or push back some encircling enemies and a few others. The rest of a player’s moves are tied to their Combat Deck. Here players can equip loads of different moves to eight different slots. Each of these slots corresponds to one of four “Stances”. Players can create huge flowing combos and pick powerful transitional moves. The selection screens for combat and gear aren’t explained upfront and can be very confusing at first. You really have to dig in to understand each of the systems. While combat choices are pretty slim when you first start out, you’ll fill in much of your Combat deck quickly within the first few hours. By dodging and blocking enemy attacks you gain knowledge of moves you don’t currently have. Do this enough and you’ll eventually unlock new moves to throw into your deck. Each move in your deck has certain starting and ending stances that will determine what you can and can’t combo into or out of. I tried my best to create a deck that if executed properly could loop infinitely. I’m not sure if this was the best strategy or not but it seemed to work well and it gave me a better understanding as to what was coming next in a combo chain and what attacks came from what stances. You can also manually adjust your stance by holding right trigger and pointing your control stick toward whatever stance you’d like to better suit your current predicament. At first I didn’t use this much, but, after a few hours went by, I was doing it constantly because it was imperative to use certain strikes in certain situations. Hitting block immediately after throwing out an attack will feint the attack. Again this was something I didn’t understand how to use till much later. I started using it to bait out certain attacks and counter accordingly. This is how Absolver makes you thing about fighting differently than any other fighting game I’ve ever played. It doesn’t handle it’s complexity in the same way as a Tekken or Soul Calibur. It isn’t about memorizing overly complicated inputs. It’s not about chaining special moves together that are Down Right Fierce(puns are fun). Absolver derives its complexity in understanding the tempo and timing of fighting; The management of space and stamina and it does it damn well. Often, by accident, fights would end up looking choreographed. This was especially the case when fighting another player as opposed to A.I. I can’t even explain how cool I felt the first time I ducked a high shot, jumped over a low shot, and counter attacked an opponent. 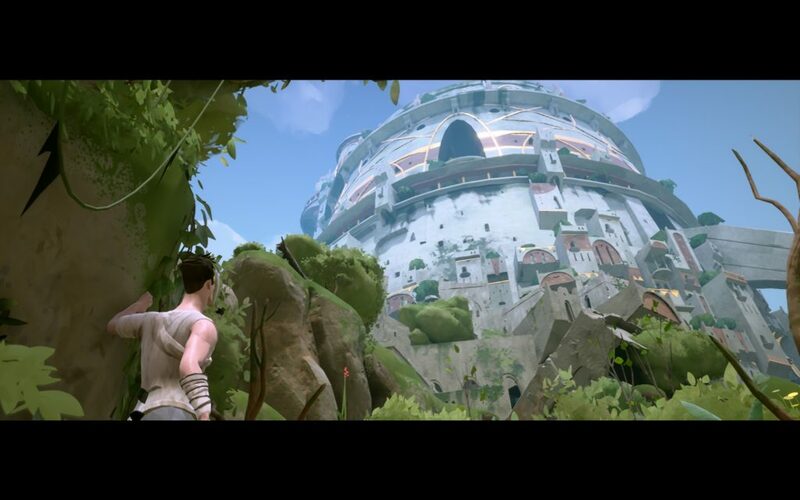 That’s one of the really interesting facets of Absolver. Not only is the combat weighty and balanced, but it also has the tendency to just feel and look like it’s straight out of an old king-fu flick. Though Adal is small, it’s all intricately designed and pretty easy on the eyes. Soft Pastels and a minimalistic art style make Adal look stunning without being to visually busy. This tonal shift away from high-definition sprites and character models isn’t foreign to the world of indie game development. Polygonal and Voxel models are all the rage at the moment. But here, Sloclap did such a good job of making Absolver’s package so ambiguous that any other stylistic choice would have been a disservice to the rest of the game. There were a ton of times where I stopped dead in my tracks just to take in my surroundings. 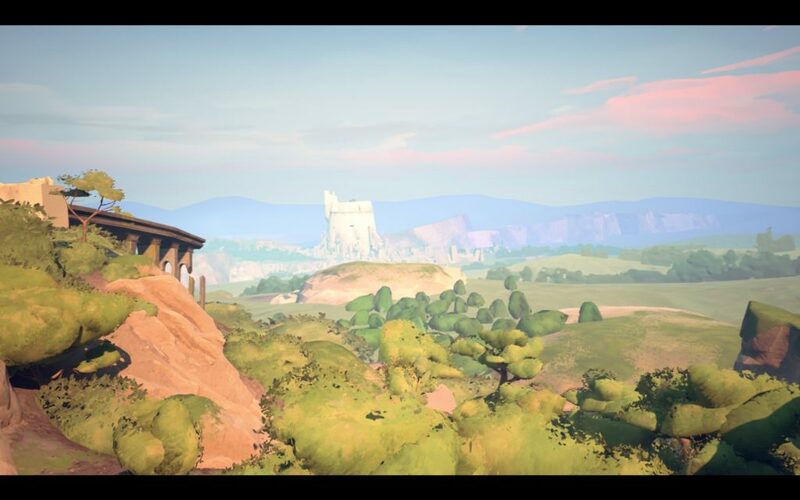 Whether it was looking over a vast forest or staring up at a massive tower, I was continually surprised at how gorgeous this compact open world was. Many people at a glance have compared Absolver to Dark Souls. While I understand the comparison at a base level I don’t think it’s apt in describing the core experience of what Absolver is. It’s very much in it’s own category. It’s kind of a simulator in a sense. It’s more about the feel of the combat than the look of it(though it does look great). Absolver, altogether, in everything it presents and how it presents them seemingly has a singular purpose: It is laser beam straight from martial arts to a controller and in that pursuit it absolutely succeeds.